HI-SEAS crew member Andrzej Stewart tries on a modular space suit designed by students Erica Kim 18 AP/ID (center) and Kasia Matlak MID 17 (right). Grad student Kasia Matlak MID 17 and undergraduate Erica Kim 18 AP/ID took advantage of a rare opportunity to consult with “virtual astronauts” on a space suit they designed and made for a simulated mission to Mars. 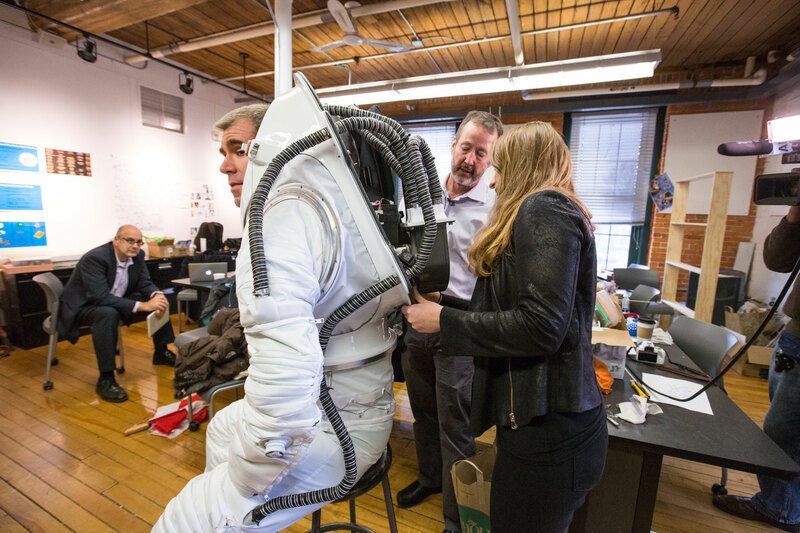 Working closely with RISD’s longtime NASA Coordinator Michael Lye 96 ID—a senior critic in the Industrial Design department—Matlak and Kim helped to develop the suit during a yearlong independent research project. In January they plan to ship it across the Pacific for the next Hawai’i Space Exploration Analog and Simulation (HI-SEAS) mission, an extended stay inside a solar-powered dome that simulates long-duration space exploration. 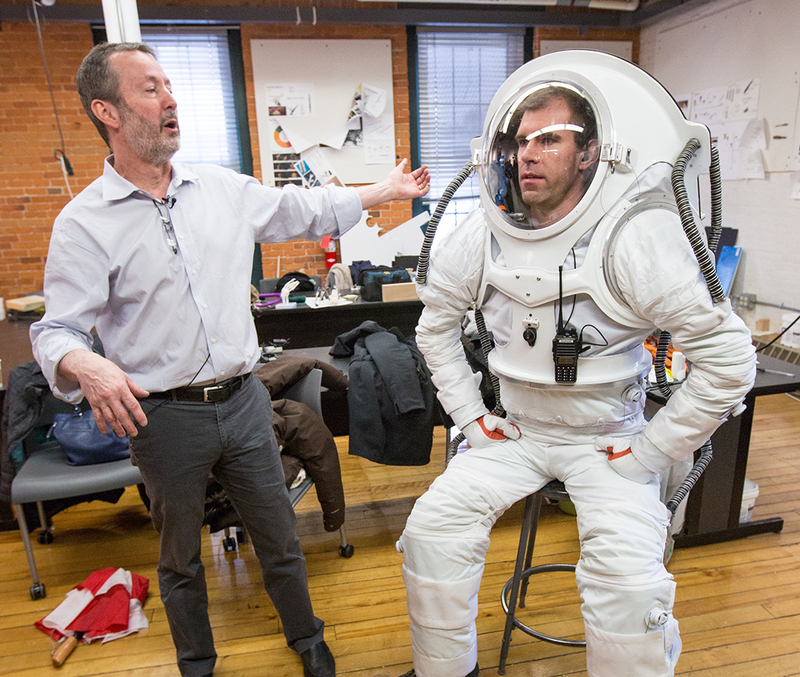 On Monday, December 5, the team unveiled the suit and helped HI-SEAS Chief Engineering Officer Andrzej Stewart try it on for comfort. “Are you feeling claustrophobic in there?” Lye asked via a two-way radio system. “No, but I’m an ice hockey goalie in my free time, so I’m used to wearing a lot of gear,” Stewart quipped in response. Lye points out various features of the suit. Weighing in at approximately 50 pounds, the suit feels a little bit lighter than what an actual (heavier) space suit would feel like on Mars, where the gravitational force is weaker than Earth’s. It’s also much easier to get in and out of than typical space suits now in use, taking about 15 minutes and requiring the help of just one person. 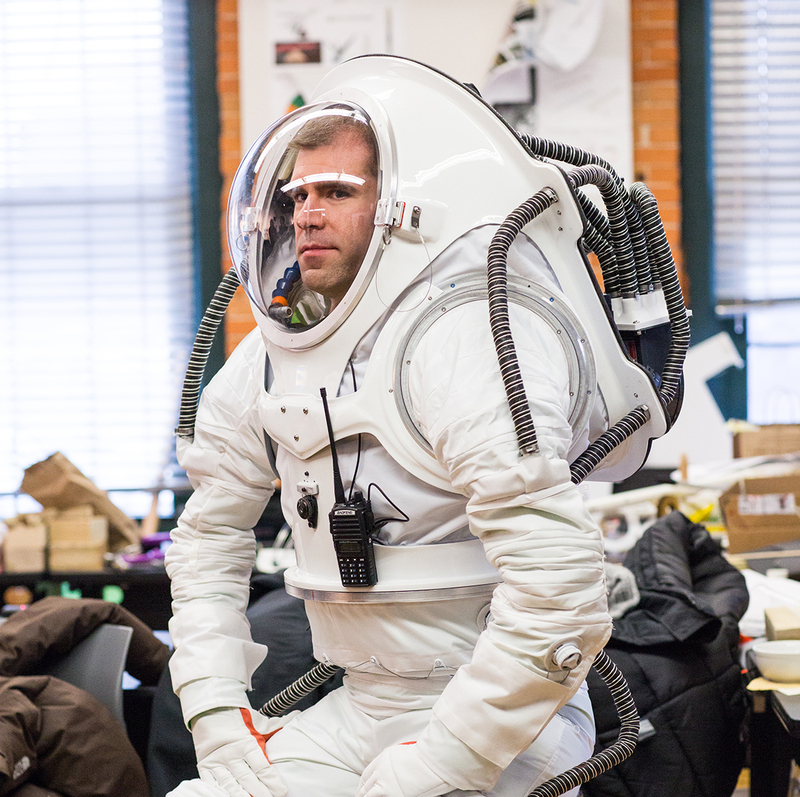 Since the suit will not actually be worn on Mars or in outer space, it doesn’t need to be pressurized. But a carefully considered ventilation system will clear the helmet of exhaled carbon dioxide and keep the wearer cool on top of the Mauna Loa volcano, where the simulation missions take place. The design utilizes external ventilation hoses that make the suit far more comfortable for crew members than the simulation suits they’ve worn in the past. “Being design students rather than engineers, Kasia and Erica bring an interesting perspective to designing for space,” says Lye. “They came up with most of the great ideas.” One of those is creating a modular suit that can be adapted to fit a wide range of users ranging in height from 5&apos;2" to 6&apos;3". Kim showed visiting scientists and journalists how the fully lined sleeve modules zip together. Her background in apparel design has been invaluable to the project, says Lye, noting that she was responsible for sewing the heavy-duty nylon garment together. “The challenge,” says Kim, “was working on various hard and soft components at the same time and guesstimating the fit. I used boning and padding in the sleeves to create rigidity and replicate what it would feel like to wear a pressurized suit.” A cinching strap inside the elbows makes it easier for the wearer to bend and flex his or her arms. “When you’re designing for extreme situations,” Matlak adds, “you think a lot about function, comfort and ergonomics.” Her thesis project focuses on designing sockets for prosthetic limbs, so she’s accustomed to thinking about issues like these. Another key consideration was budget. Materials costs totaled approximately $10,000, which is a small fraction of the $1-million+ price tag affixed to actual NASA space suits. Funding from HI-SEAS and a NASA Rhode Island Space Grant made the project possible and the hard components—including the composite torso piece—were made with molds manufactured by a local ship-building company. Artists, scientists, designers and educators share ideas and stimulate new avenues of thought at RISD’s biennial Design Science Symposium. As the first speaker in ID’s 2015–16 lecture series, European writer and design advocate John Thackara challenges students to design a better world.